Chidambaram city of district Cuddalore in Tamilnadu is famous in India mainly for two things one is Thillai Nataraja Temple and another is Annamalai University. I visited both during my visit to Chidambaram city. Lord Shiva dancing form called as Nataraja. Nataraja means kings of dance. Before Nataraja Temple, I had not seen any Lord Shiva temple where we worship Lord Shiva in the form of Nataraja. In the Nataraja Temple Lord Shiva worshiped as Akash Lingam so there is no physical Shiv Linga. This Shiv temple is popular in India by various names such as Chidambaram Nataraja temple, Thillai Nataraja temple, Nataraja temple, Shiv Nataraja Temple and Chola’s Temple Chidambaram. Chidambaram city was previously called as Thillai. That's why this Lord Shiva Nataraja Temple is popular as Thillai Nataraja Temple. Before visiting this temple, I really didn't know Nataraja temple's unbelievable facts and grandness of the temple. After visiting this temple, I knew about temple unique features. Here I share some information with all of you. There are lots of reasons to see Chidambaram Nataraja Temple. Some of them listed below. Largest Lord Shiva temple in World. It is among the Pancha Bhoota Sthalam. It is among the top largest temple of the World. Nataraja temple is the identity of Chidambaram city. Nataraja temple is also popular for its Chidambara Rahasyam (secrets). 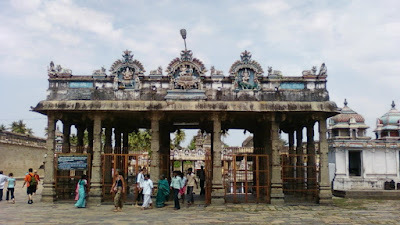 It is among the best architectural and very ancient temple of Tamil Nadu. As per mythology, Nataraja temple was constructed by the King Simha Varman. As per the story, he was cured of leprosy after taking a dip in the pond of Thillai forest. The exact date of the temple construction not found anywhere but major constructions of the Nataraja Temple during the 9th to the 10th century by the Chola's Kings during their ruling period (880-1279 CE). On the inscriptions, many descriptions are given for temple construction during the periods of Cholas, Pandya kings and local rulers. Who was the Nataraja temple founder is not known exactly but details of this temple are found in many religious historical books such as Chidambaram Mahatmyam. The Nataraja Temple is rectangular in the area and spread over more than 50 acres. Inside the temple campus various small shrines, halls, pond, and entering gates. There are four towers in each direction and each tower is approximately more than 40 feet in height. The temple towers (gopuram) have lots of poses of Bharatanatyam and stories related to Lord Shiva statues. In the Nataraja Temple, all major things are listed below. In the Nataraja temple, there are Shrines of many Gods. Which listed below. There are five courtyards called 'Prakara' and the general public can only entre till the fifth to second Prakara. Only priests can enter the first Prakara. 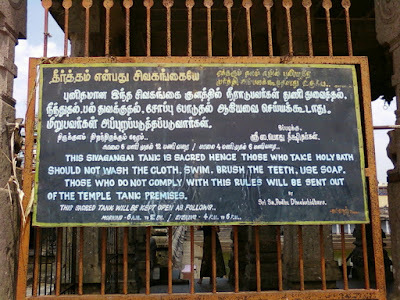 There is a holy water tank called Sivaganga Tank. Nataraja temple of Chidambaram is among the Pancha Bhoota Sthalam. Pancha Bhoota Sthalam means five prime elements of nature which are land, air, sky, water, and fire and Chidambaram Nataraja temple refer to the Sky element. The other temples of Pancha Bootha Sthalams are listed below. Ekambareshwarar in Kanchipuram represents the Earth element. Jambukeshwarar in Thiruvanaikaval represents Water element. Kalahastheeswarar in Sri Kalahasthi represents Air element. Arunachaleshwarar in Tiruvannamalai represents Fire element. All these temples are Lord Shiv temples and in each temple, Lord Shiv worship as per representing the element. 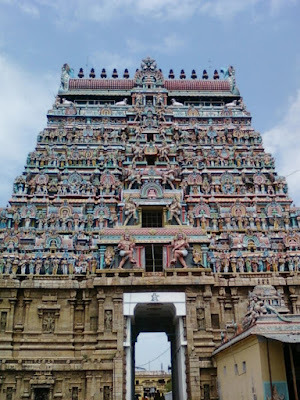 Thillai Nataraja temple is the largest Lord Shiva temple in the World. Nataraja temple is spread in the approximately 40 acres in the main city of Chidambaram. The Largest Hindu temple of the World is Angkor Wat which is situated in Cambodia and spread in approximately 500 Acres. It was originally dedicated to the Lord Vishnu, later it became a Buddhist complex. 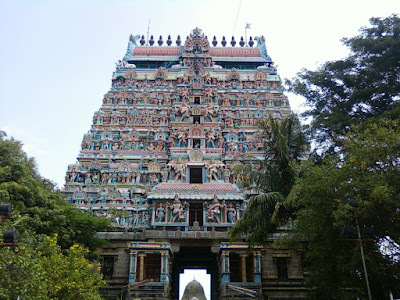 Nataraja temple is also the second largest Hindu temple in Tamil Nadu. The first largest temple is the Sri Ranganathaswami Temple situated in Srirangam, district Tiruchirapalli, Tamil Nadu and spread in 156 acres area. Chidambaram Nataraja Temple is the world's fifth largest Hindu temple and spread in over 50 acres. In India, it is the third largest Hindu temple. Maximum festivals are celebrated in Chidambaram related to Nataraja temple functions. Rathotsava or Car festival is one of the main festival celebrated very prominently in Chidambaram Nataraja temple and in the Chidambaram city. Lots of traditional and religious functions organized in the temple during the festival. Car festival is celebrated two times in the year. All Hindus celebrate Rathoutsav very joyful. Car festival is organized as per Tamil Hindu calendar calculations. Chidambaram temple is one of the Lord Shiv temples where you see Lord Shiva Nataraja in the cosmic dancing form. Nataraja Temple is unique to other Lord Shiv temples in sense to worship Lord Shiv in the Aakash Lingam form. Nataraja Temple has four very big towers in four directions. Each tower showing historical events in the form of statues. Nataraja (Lord Shiva) and Govindaraja (Lord Vishnu) both are adjacents at the same place in the Nataraja temple. Nataraja temple is unique in the point that it has statues of Brahma, Vishnu, and Shiva. Which not found easily in other temples. A human takes the 22600-times breath in a day. For representing this in the temple there is a Golden roof which is made up of 22600 tiles. A human body has 72000 veins. For denoting this temple has 72000 nails fixed on the wooden roof. There are 9 pots in the temple, representing the human body 9 gateways. For representing Hindu's four Vedas there are four pillars in the Chit Sabha. There is a mandap which has 18 pillars representing Hindu's religious 18 Purans. In the Nataraja temple, Lord Shiva Ananda Tandav form is represented everywhere. There are lots of bronze metallic statues of Nataraja in different poses. Chidambaram is a hot place and during summer visiting this place is not advisable. April to June is the hottest months and from October to December there will be raining. So as per my recommendation best time to go there from July to August and January to March. Best time to visit the Nataraja Temple will be during the Arudra Darshanam. So don't forget it. Chidambaram Nataraja Temple best visiting hours will be in the evening when Lord Shiv Lingam and Nataraja Statute worshiped would be performed. You can visit the temple in the morning also and see the various religious activities in the temple. Nataraja Temple remains closed in the afternoon from 13:00 pm to 16:00 pm. So keep Nataraja temple timing in mind before going there. In the Nataraja temple, there is six times the worship of Nataraja. Three times in morning session and three times in the evening after 04:30 pm. So you can go there any time and involved in the worship of Nataraja. There is no entry fees or ticket to entry in the World largest Lord Shiva Temple. Nataraja temple has four ways. So you can go there from any gate. Nataraja Temple is in the main city so outside the temple there is the car or bike parking space is there. You can park your vehicle roadside any of the ways of the temple. There is a parking fee for vehicles. Drinking water is available inside the temple but for the washroom, you have to go outside of the temple. I reached there by bus. I first came to Chennai by railway then by using state transport bus I reached to Chidambaram. Chidambaram Nataraja Temple is just 2 km from the Chidambaram Bus Station and if you are at Chidambaram Railway Station then it will be only one km from the railway station. For traveling in the city you will easily get an auto and private taxi. Chidambaram is well connected by both rail and bus services. The State Transport Corporation operates many buses for long and short distances daily at the regular time interval. So you will get easily bus for cities such as Chennai, Bangalore, Salem, Erode etc. Chidambaram railway station also well connected to nearby cities. You will get easily trains for Chennai, Cuddalore, Varanasi, Bangalore, Tirupathi, Mana Madurai, and Rameswaram. Nearest Airport to Chidambaram is the Puducherry which is approximately 60 km far away. The second nearest Airport is at Tiruchirappalli which is approximately 165 km far away from the Chidambaram. Chennai Airport is more than 200 km far away from Chidambaram. I will recommend visiting this temple full day because in a few hours you can't visit the whole temple. There is no special or VIP or VVIP queue for visiting the Lord Nataraja and other Gods statues. Nataraja Temple is so big so be careful with your kids they can go here and there. Nataraja Temple is closed in the day time for 3 hours. So you can take lunch and relaxed outside the temple or can shopping in the local market. You can't take photos or pics inside the main temple. But you are free to take pics outside the temple. In the Nataraja temple, a big pond is there in which lots of fishes. You can give foods to them. Don't drop litter inside this historical Nataraja Temple. Many foreign tourists come here to visit this temple. In Chidambaram local people speaks Tamil and English they don't know Hindi. So you learn some words in Tamil it will be beneficial for you. You can speak in English also literacy level is good there. In the Nataraja Temple, you will get all facilities free of cost so don't give money to anybody for anything. Other than bathing and using for worship water of Shivganga is prohibited for other purposes such as washing, swimming etc. You will get many hotels and Lodges to stay there easily but during festivals and peak season you have to book in advance for getting a room.